Ahhh, don’t you love a nice, cheesy pun in the morning? I know I do! If there was an emoticon (Omg, am I dating myself by using that word? Do people even use the word emoticon anymore? Do emoticons even exist anymore?! A quick search shows yes. Still, why do I feel like such a geek for discussing emoticons? Do I even want emoticons to exist anymore? Ok, back to the sentence) showing someone giving a wink, wink, nudge, nudge or slamming on to the top of a microphone saying, “Is this thing on! ?” then that would have gone at the end of the post title. Regardless of how stupid the title of this post is, the finished product was better than expected. 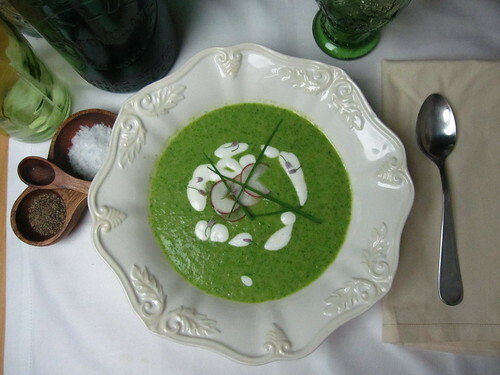 Since I met my husband Jonny, I have heard about his mother’s famous Lettuce Soup, always made with butter lettuce (also called Boston or Bibb). Unfortunately, Jonny’s mother passed away many years ago and he is left only with the memories of the way his mother cooked this fabulous soup, remembering the flavors only in his mind. This soup is meant for summertime, when lettuce is absolutely fresh and it’s too warm outside to eat a bowl of piping hot soup. 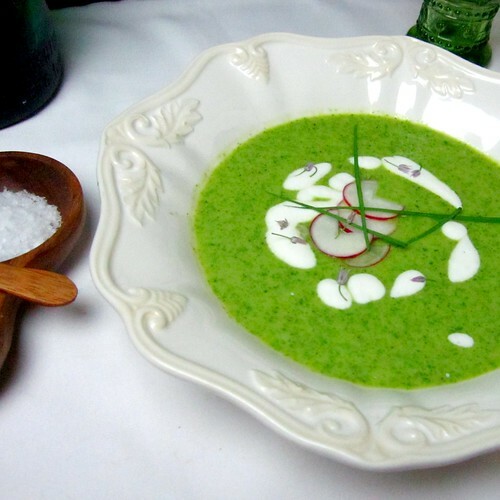 In fact, like a gazpacho, melon or cucumber soup, this soup is to be eaten cold. Think of how delicious a crisp salad with buttermilk dressing is – the flavors just go together. This soup is very basic, very simple and very refreshing. So I raise a glass to Jonny’s mom and thank her for not only raising an amazing man, but also for serving her kids her lettuce soup! Boil some water and make an ice bath by putting ice cubes and cold water into a bowl. Chop the bottom of the lettuce and immerse the leaves of the lettuce in the boiling water for thirty seconds. With tongs, remove the lettuce from the boiling water and “shock” them in the ice water to keep their color. After cooking in the ice water, remove and allow to drain and dry on a towel. Meanwhile, in a tablespoon of olive oil (or a pat of butter), sauté the diced onion until translucent. After three minutes or so, add the boiled potato and stir. Add a pinch of salt. Toss in half the chives and stir again. After a minute, add the fino sherry or wine and allow to cook down (about one minute). As soon as the alcohol has been absorbed, add the stock and stir. Add the rest of the chives and allow to cook for 30 seconds then kill the fire. Remove pot from stove and add half the cup of buttermilk to the pot along with the cooled and drained lettuce and start blending in the pot with the stick blender (if using a blender, add everything in and puree). Add the final bit of buttermilk and blend one more time. Chill in the fridge for an hour or in the freezer for 20 to 30 minutes. 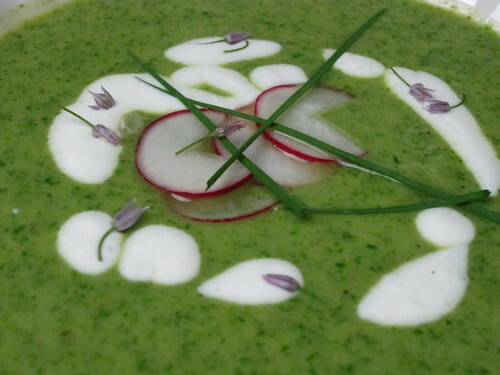 Serve in bowls with some chopped chives and sliced radish and swirl in some thinned sour cream, buttermilk or regular cream! Enjoy. Mmm! This sounds delicious, especially with the nice lettuces that are in the farmer’s market now. I’m not a huge gazpacho fan, but I bed I’d love this. Thanks for sharing it. What a lovely tribute to Jonny’s mom! And so glad you liked the soup 🙂 Looks very similar to a watercress soup I make. This soup is brilliant, really. It makes so much sense. And yet, somehow — my mental tastebuds cringe at the thought of pureed lettuce. WHich means I’ve got to get me to the kitchen and make some of it. Cuz I won’t be lettin’ no mental buds boss ME around! That make us laugh and now lettuce tell you that we think this looks right up our strada. This is one for the books. Lettuce soup? Really? Hmmm. It does have a great color, though! Just looking at this color I’ve already convinced! Look gorgeous and sounds delish! This looks fabulous. I’m definitely going to make it when I return from my trip. What perfect summer fare! We had one of those “lost recipe” things, too, but the recipe actually turned up, years later. I’d tried to re-create it based on D’s suggestions, but he said it never tasted quite the same, and when we finally found it… oh. yeah. He was right. My Grandmother apparently had a famous lemon meringue recipe and was a fabulous cook, but my mom, who does NOT like to cook threw out the recipes. I guess I still love her, but…. The color is beautiful. 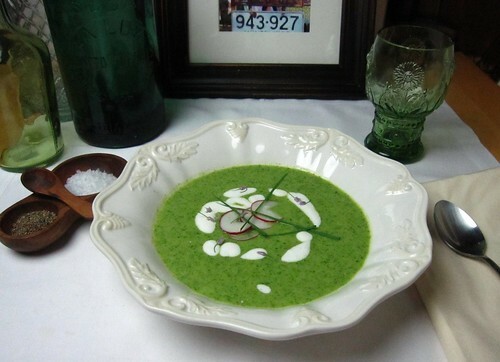 I’ve never made butter lettuce soup before. Sounds yummy. This sounds really good. I’m always looking for more creative ways to use lettuce. I tried braising it once – the results were not good. I have made soup with a lots a green, but never thought of turning lettuce to soup. Looks pretty convincing to cool us for the season. I’ve had Romaine lettuce in soup before and loved it. It was like asparagus soup. This sounds like such a wonderful summer meal, and the photos are gorgeous! This is such a cute post and such a beautiful soup. Your photos are just brilliantly beautiful. They convinced me to try this. Though, as usual, lacking something, I substitute. No butter lettuce, so will use the Savoy and Tatsoi from my garden, since that’s what I have. Any lettuce except for iceberg is A-OK in my books and this chlorophyll delight looks fab. With the way this summer’s behaved so far, a soup might be made soon. Lovely tribute to your mother in law. I must say I wouldn’t have even thought about trying this dish until I read your post about her. And i raise my glass to you both for cooking with lettuce! I haven’t made a lettuce soup in a while but i know they can be delicious. I could go for some right now. It’s a coincidence but one of my friend made a veal with a lettuce-brown butter sauce a few days ago which i just posted today. It was fantastic. ok, heading there right now… lettuce-brown butter sauce. hells yeah! i think that lettuce is totally underused as ingredient in anything else but salads! thanks for the support on the lettuce soup. sometimes we don’t think things are that k-razy of recipes and then we post it and it’s like “crickets” in the comment section. i would prefer people tell us it looks like barf and they’d never ever try it instead of saying nothing! we’ve got thick skin… come on, bring it! Sounds so refreshing! I’m actually a huge fan of cooked lettuce, braised, boiled, fried, roasted. But I can’t say I’ve ever thought of blanching and pureeing. it keeps the color really fresh – it doesn’t really add any flavor. i think people may be turned off by the idea of pureeing lettuce but most wouldn’t think twice of doing it to spinach or kale. kinda interesting! it’s really not as scary as you think – imagine it’s spinach or kale or other leafy things most people don’t mind wilted! You know, I have yet to try a cold soup. I don’t know what my problem is … this looks great. I have no qualms about cooking lettuce; we actually use it frequently in Greek cooking (i.e. Fricasse) and I think this soup looks delicious. Love the swirls of sour cream! What a beautiful looking soup!! The green is absolutely gorgeous. Sadly, I never really think of having a chilled/cold soup living here in San Francisco, but I will definitely have to remember this the next time I’m visiting (and cooking for friends and/or family) in Southern California. Word of warning. Make sure that you like buttermilk first as you will taste it in the finished product. I suppose if you like buttermilk this is an interesting, tasty food, but if you’ve never had it be sure to try it first. I hadn’t had it since I was 10 (I’m 30 now). I didn’t like it then but hadn’t thought to retry before cooking. Out of 4 that I served, only 2 had tried buttermilk before and didn’t like it and 2 had it for the first time in this soup and didn’t like it. We ended up going out for dinner. Also, if you have any lactose issues be careful as apparently buttermilk will set them off very easily. @Chris: we’re sorry you and your guests didn’t enjoy the soup. Certainly buttermilk has a slightly sour flavor that may take some people unawares, and lettuce soup is pretty uncommon for a lot of people too. Perhaps your guests were expecting something a little more conventional? It’s a dish I grew up eating in the summer and my family and I love it, but it’s not for everyone, apparently.